In any niche group of investing, there are good, average and poor assets. During a good market run, the good, average and poor REITs will all do well. You want to hold on to good REITs that handle themselves well in good, average and bad environments. When it comes to REIT and other dividend focus stocks, the narrative by the media tends to focus very much that REITs are interest sensitive assets. They are not wrong. However, I felt they did not present other factors that determine REIT performance. In this article, we will cover some of the important, high level considerations in identifying REITs for buy and hold, or for speculation over the longer term. The underlying assets in a real estate investment trusts are properties and investors all over the world have been handling them for centuries. There are good investors and poor ones. The difference between REITs, and various forms of property investing lies in the rules that govern financing, taxation, what can be done, what cannot be done. What governs the underlying asset is largely the same. To learn about what we should watch out for when we try to select REITs that show sustainable performance, we can learn a fair bit from people that have done well. I rank this criterion the highest because a REIT is a collection of properties. They can be just four walls. What makes the properties come alive depends very much on the creativity of the people managing them. These are what a good manager brings to the table. If we flip it around and that is the manager working on the property assets, would you be comfortable with him or her team? Successful buy and hold investors on individual properties over time are successful because their money is in it and they generally learn from experience and do the above scope well. They are somewhat like a REIT manager. When you purchase a REIT, perhaps over purchasing individual properties, it is that you want to delegate some of these scope that you cannot perform, or not good in to the manager. It would be good to pick good managers, on a systematic basis to check on their performance and decisions rather than always worry about whether the managers will make less than appealing decisions. This will make your wealth machine more passive. How do we evaluate the quality of management? If you know the manager through your professional capacity, or from tracking where they used to work and how they used to manage things, you have an edge in evaluating them. For most of us, this evaluation have to come from reviewing the decisions the managers made in the past for the REIT, in the context of what is happening, so as to derive if they are worth what we paid them to do. This would mean if you want to purchase this REIT, say Ascendas REIT (dividend yield 6.2%), review its past performance, then go to read all the available announcements on SGX or in Annual Reports published on SGX. You will gain an appreciation if the managers are conservative, learnt some lessons over time and made better decisions, or continue to be very destructive. 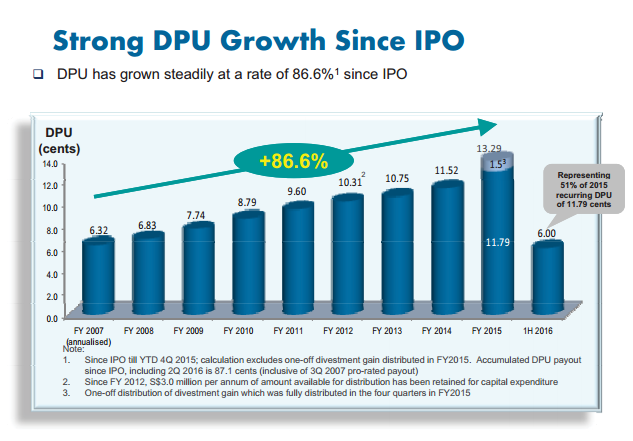 If you review and pay attention to the slides released by REITs over time, you can find the dividend per unit (DPU) change year on year. At the end of the day, as investors we look at our reward in what we get in DPU, not net property income, as well as Capital Growth of Equity (to understand total return of REITs, read how does REIT grow?). We contrast this to what the REIT take from us: IPO money and Rights Issues. Good managers should give us more than what they take from us. The following slides were taken from presentations of 4 REITs in the past. 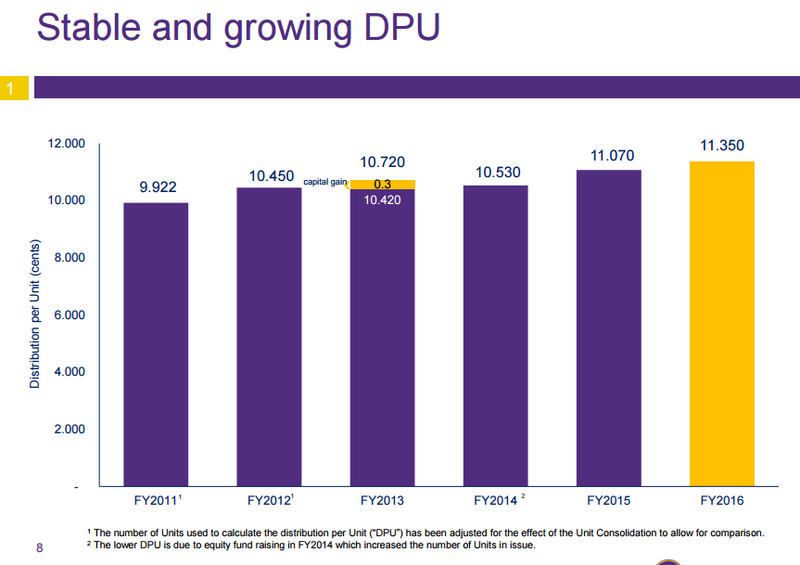 It shows consistent DPU growth over time. Perhaps you can guess which REIT these are. We always take a look at various challenging times, to see how management reacts to those scenarios. We have 2 periods in the young life of the Singapore REIT market. That is during the 2007-2009 Great Financial Crisis (GFC) and current period where almost all REIT is facing falling occupancy. In the industrial space, it has been particularly challenging for Ascendas REIT, Mapletree Industrial, Mapletree Logistics, Cambridge REIT, Aims Amp, Sabana, Viva Industrial. Here is where you can see whether there are managers that can navigate this period well. 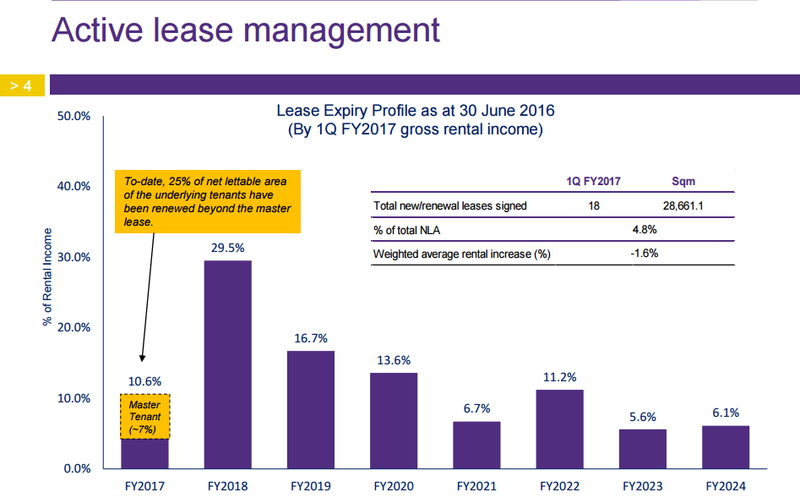 Many of the REITs that owned master leased properties were converted to multi-tenanted properties, therefore lowering their occupancy. Some were not able to lease out their properties after the master lease expired. Sabana is a good example. As far as I am aware, they seem to have 2 properties vacant and this has affected the DPU. In contrast, Aims Amp Industrial, which is in the same small industrial REIT category as Sabana, due to their conservative gearing, and their relationships with partners, have the opportunity to develop a built to suit in this period. Ascendas REIT, have the opportunity to do the opposite, carrying out an AEI to convert a multi-tenanted into a sale and lease back, when most REITs faced the opposite. Although, the impact of this to Ascendas REIT is opposite. The lesson learn is that, sometimes you need to pay attention to bad decisions as much as the good ones. If you read through some of the past slides or announcements for acquisitions, you may find clues that tell you if you would want to sleep with this manager. 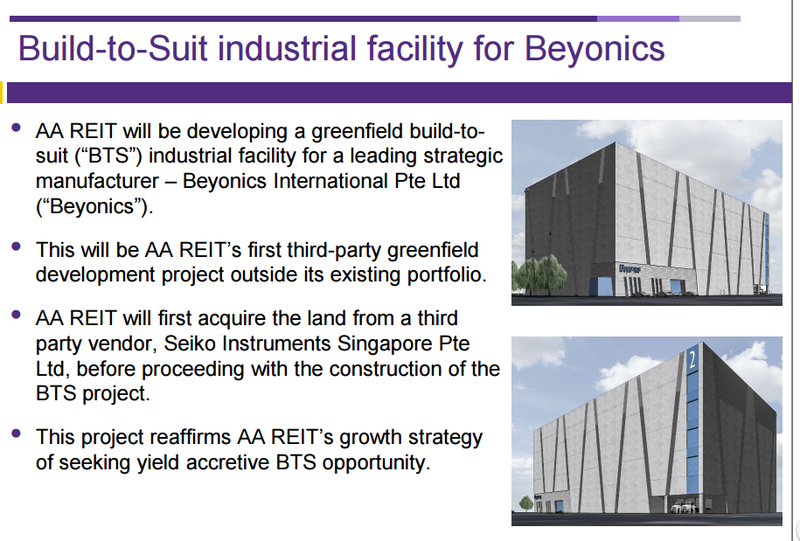 A good example is Keppel REIT. While its portfolio looks splendid with numerous grade A properties that are young and with long tenant lease, the share holders are not very happy with it. I used to think only a few people spotted this, but turns out more and more are waking up to it. Majority of the purchase was from the sponsors Keppel, which is their parent. Freehold or 999 year properties were sold at 99 years. They were sold at high so that Keppel realize good value. There were much rights issues in the past where they asked the shareholders to purchase more properties. 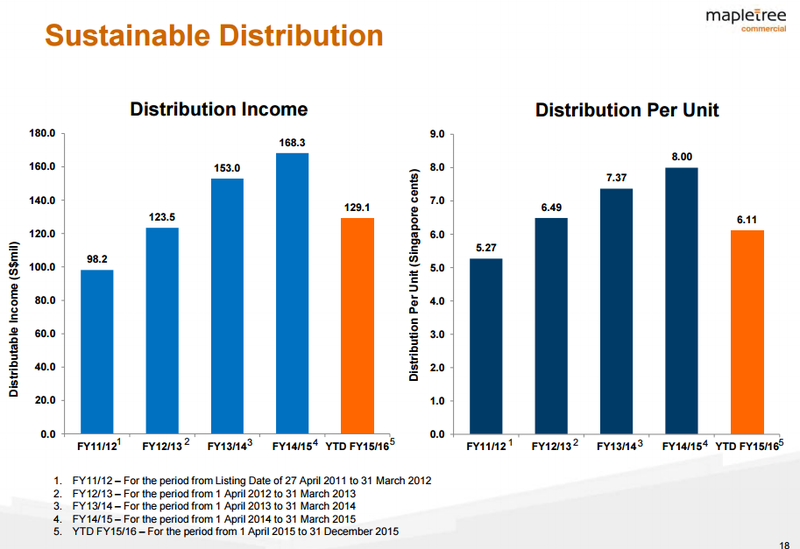 The shareholders asked them in return: How much have that translated to increase in dividends per unit or capital growth? The last annual general meeting (2015) was very fiery. 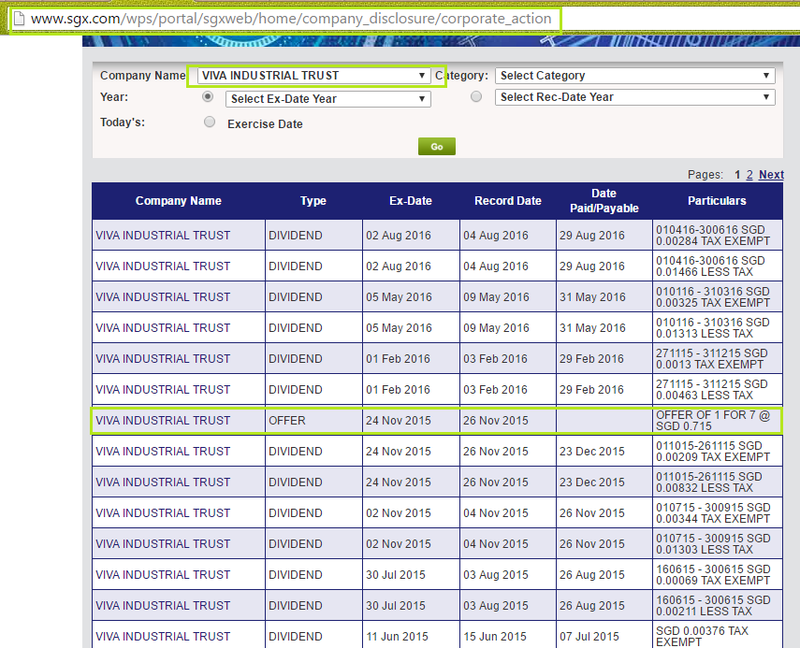 Cache Logistics Trust (dividend yield 8.6%) is a manager of various logistics assets in Singapore. Their appeal to shareholders is that their assets are leased to single tenants for about 6 years duration. In 2014-2016, many of these single tenants did not renew, and they have to be converted to multi-tenant. This therefore affects occupancy and the aggregate net property income. However, before that, they embarked on a rights raising, debt raising initiative to purchase a group of Australian Logistic Assets. 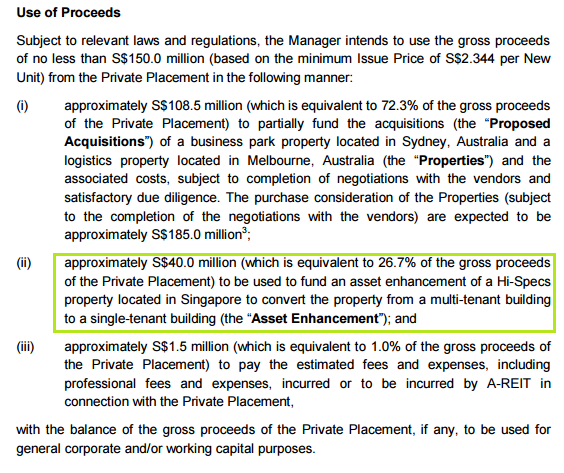 Like other industrial REITs from Singapore, they are late to Australia. However, if you think about it, had they not perform that move, their results would look worse than what it looks like now. Similarly, the same time Cache Logistics moved into Australia, Ascendas REIT also made the same move in FY2016. The only difference is that Ascendas REIT is much larger, being one of the top 2 biggest REIT in Singapore. Most did not think that they could make a dramatic shift, which is surprising when they were able to carry out a series of debt, preference and rights financing to acquire a $1 billion worth of Australian portfolio, shifting 20% of their asset based away from Singapore. It takes an adequate amount of relationships, and competency, not to mention connections to pull of such a deal. Not all REIT managers would have the resources to carry out something like this. In 2011, Suntec REIT announced that they will be doing a massive Asset Enhancement to Suntec City, to position the asset better. This AEI took place in 3 phases and over a span of years. What is of note is that, this entails letting go of their tenants, and re-signing the tenants again in 3 different times. That to me, show me they do handle various aspect of management well. They were also lucky, in that, if they had made the decision to carry out AEI 1 or 2 years later, they would have problems re-leasing to tenants in a climate where shopping centers are facing challenging times. When I heard numerous accounts of what property investors look out for, when they are prospecting places to invest, the common theme stems from how vibrant is the jobs scene. Majority of the investors were prospecting residential property, so it is no surprise that a vibrant jobs market is important. There are much internal migration between cities, province in other countries. People go around looking for employment and if they work there, they need a place to live. You do not know whether you will succeed there, or if you want to stay there for long, so you tend to rent. In the aftermath of the great financial crisis, there was much migration in population from some cities to other cities because of the declining local economy. A good example is Detroit. There are other cities that remain vibrant as their business and economy remained largely insulated. If we relate back to the local economy, the assets held by the REITs feeds directly by the health of the economy. You require a expanding economy which are producing goods and services for local consumption, or to be exported. You also need a supportive government with business friendly policies to encourage business to set up shop. With more companies from overseas coming to take advantage of the local opportunities, there are requirements for more auxiliary services to support these main economy drivers. These companies need places to operate (offices) and create things (industrial properties). Some will make use of the security and connected nature of some cities to set up their regional hub (data centers). Property leasing are based upon demand and supply, when there are excess demand, the offices, industrial properties can command a higher rental revision. In a down cycle, when more businesses leave the country, and there is less demand but the supply of properties do not shrink, you will see passing rents dip severely. Majority of the REITs owns domestic assets and thus the Singapore economy matters a lot to the performance of REITs. Since the first REIT Capitaland Mall list in 2002, Singapore have gone on a population expansion. 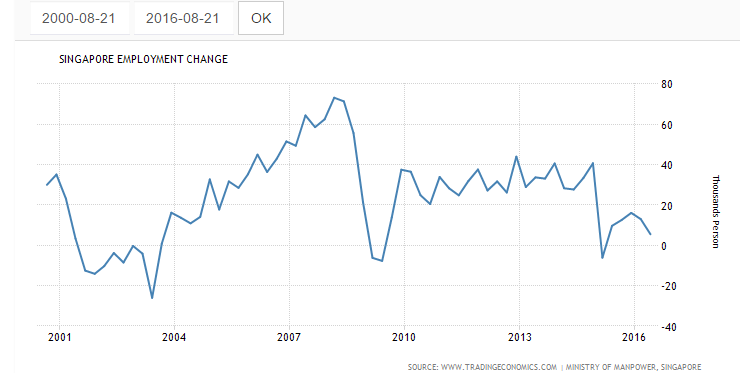 This more or less means there are more jobs in Singapore that requires more workers. 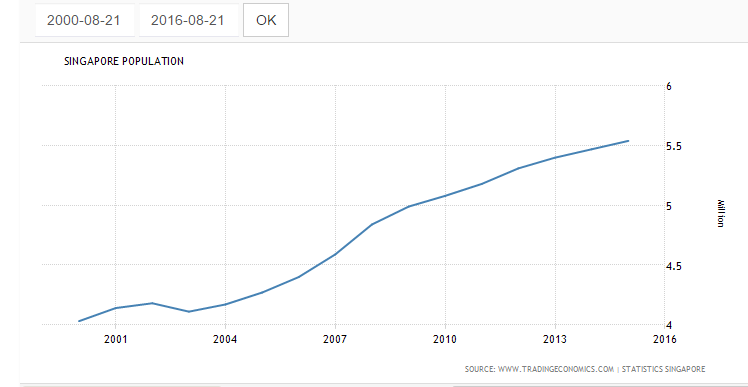 Singapore have engineered one of the lowest unemployment rate for the past 16 years. Even at its peak in 2003 during SARs period, the unemployment rate is still below 5%. For the past 10 years, the rate have been largely closer to 2%. There are three periods where the net employment change approaches zero with only a period where it is negative and that is during the 2000-2003 crisis. Many have alluded that interest rate will have a bigger impact to REITs. In this period where rates have yet to hike, we are seeing clear signs of rental stagnation, negative rent revision, increase in occupancy. Clearly, how well is the business climate have a profound impact on REIT performance. Your investment in REITs that have assets predominantly in Singapore hinges on your confidence that Singapore would remain a viable business destination for manufacturing, services in a very competitive global market place. If this is not the case, or you have a competency in another country, it may be wise to diversify since there are some REITs that have property assets in other countries. Parkway Life, Starhill Global, Mapletree Logistics, IREIT Global, Frasers Logistics and Industrial Trust, Ascendas RET, Frasers Commercial Trust are some REITs that come to mind. REITs are interest sensitive instruments. In their short history, Singapore REITs experience a few small bond yield increases. While the Singapore REIT index under perform the general Singapore Stock Index, they still generate some good performance. Cost of debt goes up, but if there are more favorable demand and supply in terms of business and economy, the REITs can have higher rental revision organically, do higher ROI asset enhancement, or acquire a well yielding property asset. Unfortunately, we have been in a 30 year bond bull market where yields have been falling. Taking the data from US REIT market, which have been around since the 1970s, there are various rate hike periods. There is little correlation that a rate hike means poor absolute performance from REITs. Rate rising tends to be an instrument of Reserve banks across the world to tighten up in an overheating economy. In that scenario, it would mean that economy is booming, which means opportunities for REIT manager to raise rent higher than the cost of debt. The worst case scenario is when rates needs to be raised because they are too low, so that the central bank have this tool to cool a future overheating scenario TOGETHER with an economy that is contracting in business. This is a double whammy for REITs as they are hit by not able to fulfill occupancy, raise rent and yet hit by cost of debt as well. Interestingly, we seem to be in this scenario now. It is important to figure out how geographically exposed to which country your REIT is. This will allow you to size up whether a declining city will have an adverse impact to your REIT. How do you evaluate jobs, business and economy? To be equipped to evaluate this aspect, you will have to spend some of your time set aside for wealth building to read up about the history of certain cities, their business climate, how conducive the government is to foreign investments and foreign ownership. Whether we are on a conversation about stocks, a country stock index, dividend stocks, property, or REITs, we have to respect valuation. When we evaluate valuation of any financial asset, we are trying to find out what is the intrinsic value of an asset versus the current trading price. It could also be what is the price we are willing to pay for an asset with a particular intrinsic value. When we talk about the REITs context, it is also the same. we are trying to find out the intrinsic value of a REIT versus the current trading price. A REIT current value is equal to the sum of its future cash flows discounted with inflation in mind. When we pay for Ascendas REIT at $2.45, we are hoping that the value of Ascendas REIT’s future cash flow is worth more than $2.45 per share. The goal here is to not overpay for something. If we buy a condo that currently rents in a peak market cycle at $2,500/mth or $30,000/yr for $2,000,000, your gross yield is 1.5%. Your net rental yield is likely to be closer to less than 1%. If you purchase it unleveraged, with cash, you can continue to rent it out when you can, but it is likely it will take you a long time (perhaps 66 years) to make back your money. Compare this condo to a 10 year government bond yield of 1.8%, and you wonder if you should be taking such a high risk investing in a condo compared to putting your money in government bonds. It is likely the value of your condo is worth closer to $1,000,000 then $2,000,000. You are likely to suffer a $1 mil impairment to your capital. A REIT, is the same. Its property assets go through good times and bad times. If you purchase the REIT at a very high price, that is not reflective of the aggregate of rental cash flows going forward, then you are likely to have your capital impaired. Notice that in 2009, 2003, 2012 where the yield is above the average, reaching close to +1 standard deviation. Buying at those periods would have render you closer to getting a dividend yield with some margin of safety, giving you a better total return, when the price reverts to the mean. However, if you buy into the idea that you can purchase REITs at any valuation, specifically like 2007, 2013, you will be going through the scenario of buying that condo at $2 mil, and waiting for a long time for your capital to return. Most likely a large part of your capital is impaired. We can also zoomed into individual REIT sectors. Not all REITs are overvalued or undervalued to the same degree. Another form of valuation is to compare the price to book against the historical. While it is easy to take a look at what is the dividend yield or price to book value now versus the historical figures, investing is about look forward. We use historical figures because conditions do repeat. However what if it is different? If you are evaluating a new REIT in the industrial sector, would the manager be performing as well as the average managers? You could assume he can, and use the historical valuation figures, but as we stressed in #1, it pays to watch for tell tale signs this manager is doing things better or worse. In the same vein, a city’s competitiveness changes. The history of Singapore REITs is about 14 years. It will be interesting if the next 20 years look vastly different from the past 20 years. In this case, would investing in a REIT that is so home country bias be a good thing? In valuation speak, could #2 Jobs, Business and Economy of Singapore be much worse that #1 the manager fails to diversify out of Singapore? This will mean future cash flow is much less than in the past. In a certain sense, #3 is a summary after we take into consideration #1 and #2. In a certain sense, valuation, cash flow and business are always interlinked. When I evaluate whether the current or future climate is good to invest in REITs, my 50,000 feet view is always looking at these 3 considerations. #1 can be very general. All the considerations that you may think matters can be covered by a good manager, and be exposed by a bad manager. If you ride the right #2 economy and business cycle, you can make money, despite the tough financing environment. To have more conviction and certainty in investing, so that you can put more of your capital to work, you require some bit of effort sussing out #3 valuation. Another great post Kyith, thanks for sharing! hi Dividend Knight, you must have a well growing portfolio. Thanks for your article. Not many people notice this issue – Reits managers are paid in million dollars units for their management fees each year. Will these dilute the value of the Reits, etc. What are your views? Hi Seng Leong, thanks for asking this good question. AT first i was worried. Then you see more and more trusts doing it. for sure it is a form of dilution. But the best analogy is a placement to the management team. Good REITs fund their acquisition with placement as well. To me, the more important question is: does this compromised the DPU? 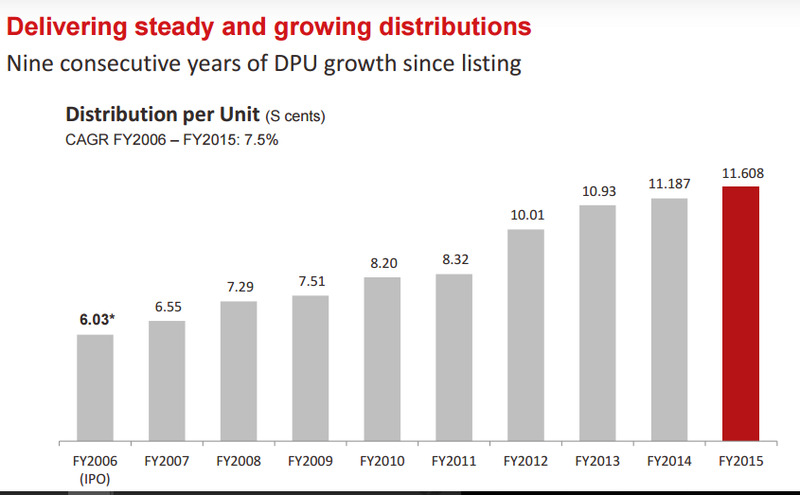 Because eventually if you acquire something and place out shares, you want the DPU to eventually go up. 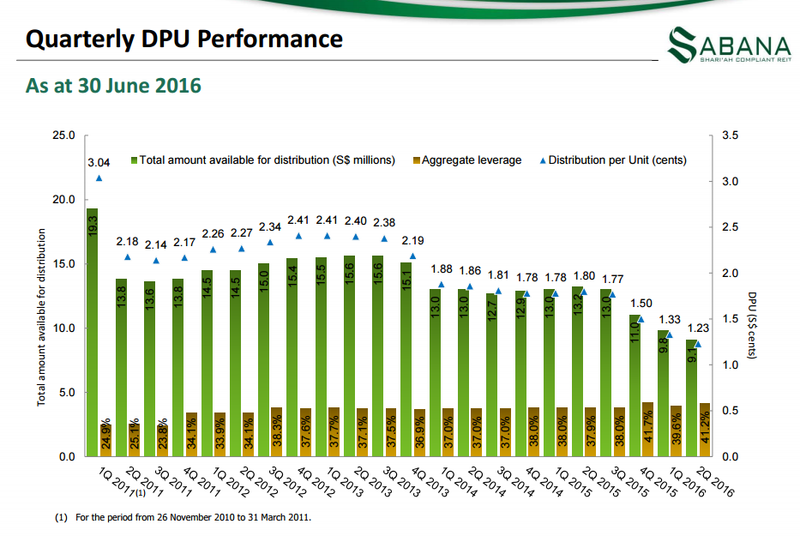 if they did this dilution, theoretically the DPU SHOULD go down isn’t it. Thank you for being insightful and provide lots of food for thought. Well written and research. Hi Kyith, thank you for the well written article and sharing selflessly your thought about REITs selection. 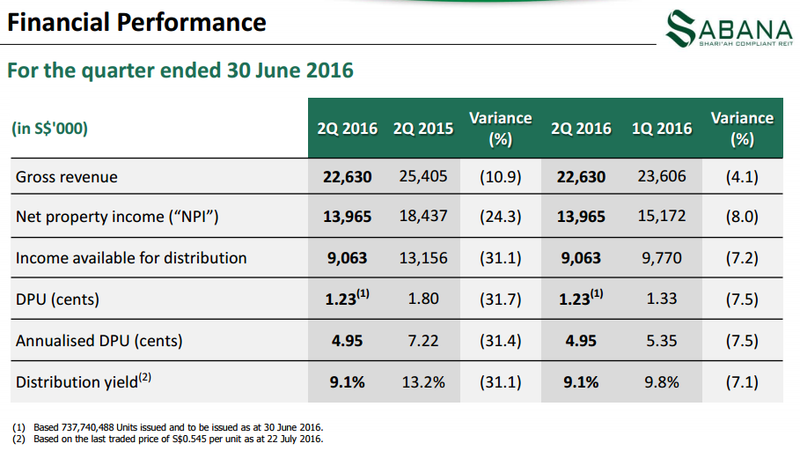 Would you mind to reveal the 4 REITs with consistent DPU growth? I can see one of them is MCT. The first one is FCT, the second is Aims Amp, fourth is PLife REIT. 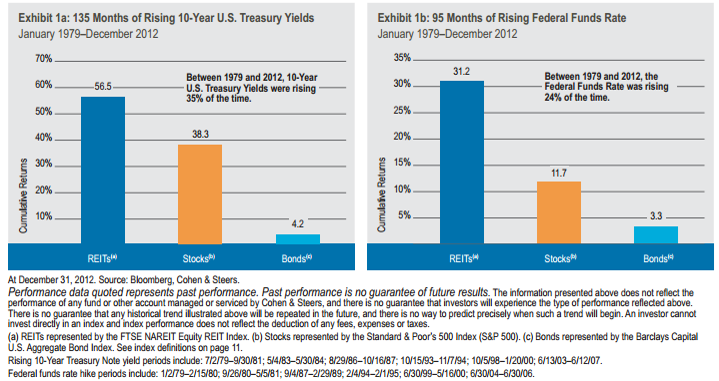 Past performance may not always indicated future returns. Thank you Kyith. I should have guessed them from the reply of Dividend Knight. I understand that past performance not an indication of future returns. Personally I feel that the valuation for REITs is a bit high now. I am holding back on my purchase and also planning to sell partially some of my REITs holdings if price continues to go up. Actually i keep hearing people say valuation is high. when it was in 2013 i heard the same thing. after the 2015 draw down, i also heard the same thing. when cct was higher than 1.76 and now its around 1.50, people also said its high. Its been some time since i see people say its low. I believe people mindset is that REITs prices are always high except in 2009 prices, and that is what is going to stop them from buying. Many thanks for being my source of inspiration ! May I know whether SGX has an index fund for Healthcare (similar to the fund using STI ETF)? I would like to explore this aspect since lots of property REITs are selling at a premium price above book value & that would leave us no margin of safety in case the market collapses. IN Hong Kong, most of the REITs are trading at a discount of 60% to 70% of P/B ratio. Regarding the REITs valuation, I am in a dilemma as I am sitting on large chunks of idle cash. Should I tolerate the opportunity costs or get the REITs first & earn the yield? The market doesn’t seem to know how to fall as so many rounds of QE all over the world has distorted the usual economic cycles (or there is rarely any cycle now). hi pf, i will answer the first question first. no i do not believe there is a Healthcare ETF. A lot of them are below 1. and its not always a right measure. do note that the hong kong ones might be misleading as well. my answer to your last question is, perhaps do a dollar cost average. 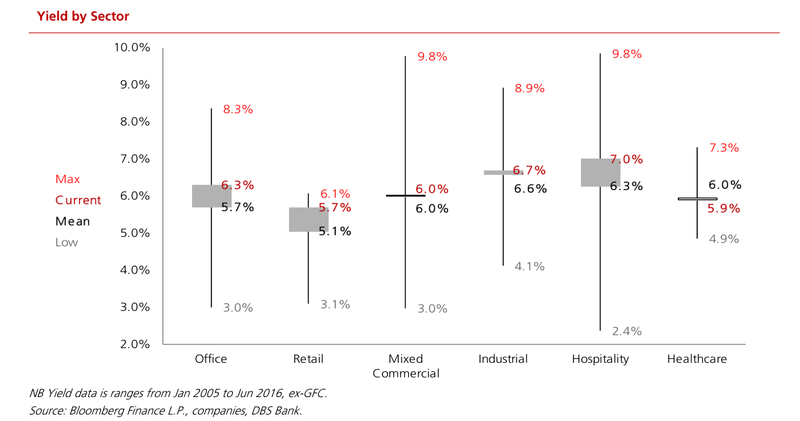 Singapore REITs are not too overly expensive. if these are challenges, they are already facing them, its not like the 2013 situation. suppose the scenario is that USA will have a draw down, rates will keep low. the alternate scenario is that rates might spike, that one we do not know how to take care of it since it is sudden. for sure most REIT have spread out their debts, so i think its more of whether you can profit from the inefficiency. split your capital and invest within your comfort range. visualize 5 years down the road, how much capital will you have. how would you build up that portfolio today. will you put all in? it depends really. if you have 20k now and every year for the next 5 years you will put in 25k, then a 50% drop won’t really kill your future capital of 145k isnt it. The idle cash is more than S$2.5 mil. As I am a retiree, therefore, any mishap in investment cannot be recouped from the employment income. To be honest, even if I don’t invest at all, the cash in hand would be sufficient for me & my spouse to pass through our life. The CPF retirement A/Cs have already been topped-up to the max of S$241,500 each. Our property has been fully paid up. Right now, the portfolio in stock market is about S$0.9 mil & I incline to take risk in ETF or REIT only. I feel guilty for wasting the potential opportunity by not using the idle cash but should I still work hard & earn more just for passing down the money as heritage of our children? I feel tired of the bombardment from various Relationship Managers’ propaganda. I have tested them a few times & found that they did not put client’s interests in mind at all. If you were I, how would you handle investment in my stage of life now? Thanks for further elaborating your situation. I felt compelled to answer your question in a post. It is something that I could explore from my point of view. I was wondering if you are open to me doing that. On that note, I find your profile suitable for my acquaintances at Providend who is a fee based adviser. 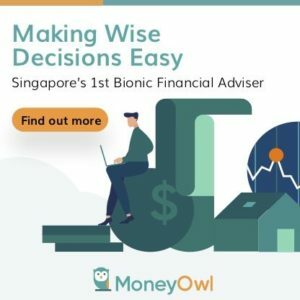 The reason why I think it matches your profile is because I know they put client’s interest at heart and recently have started using Dimension Fund Advisors index funds for their advisory, possibly the rare few in Singapore to do so. Do note I advertise for them but take no commission from these referrals, I just think you are a good match and if not you could treat it as another wasted path recommended by a prominent blogger haha. Good morning, Kyith, please feel free to open if it benefits the overall readership of your blog. However, please keep these 2nd para & 3rd para to yourself. Regarding Providend, may I bear in mind if I need their services in future as I need some time to unwind from the past memories. I feel pressurized every time when the banks’ RM contacted me. They always asked for meeting or if I declined, they tried to persuade by actually coming to my home on my birthday. They have recommended products such as Equity-linked Investments (ELI) which require me to take over some shares when the underlying share prices drop to a targeted level, Deposit Plus which are in fact Forex Options which require me to convert S$ into a foreign currency if it drops to a certain level. At one time, one RM even offered to specifically package (one package needs US$1 mil as a minimum) an ELI which was hooked to some Mainland Chinese banks (you know how much bad debts & doubtful debts they have ! I don’t believe that being in the same banking industry, the RM is not aware of the non-performing loan problems in PRC ! ) That is why when you wrote about retirees buying Swiber……….. Rickmer bonds in this country, you couldn’t understand why people could depart with their money like that but I can empathize with them. Really, they might not be as “thick-skinned” as I am, to turn away RMs & products. My skin grew thick as I got practices for many years in HK where the RMs were even more aggressive (e.g.sending mooncakes during Mid-Autumn Festival, rice dumplings during Dragon Boat Festivals, Godiva chocolates during birthdays). When I refused to buy a prominent bank’s products for too many times, they even removed the Relationship Manager & replace him with a Relationship Director to serve. In SGP, banks are not so aggressive. At most, I have experienced that they serve Goodwood Park cookies & drinks in SOME OF their Premier Baning Centres. hi pf, i can imagine your situation as how many folks i rejected to advertise on my blog haha. i am not sure but have you consulted a financial planner that is fee only or fee based to take care of the parts not so much related to finance but more to tax and estate planning? Now I get an idea why folks will buy all those junk rating bonds. Tax & estate planning are all right. I have explored these already (tax avoidance is not a crime though tax evasion is ). It is not just affinity to REITs, I also like Healthcare ETF (please let me know when this is available in SGP) as I don’t want to take risk in individual healthcare stock any more. Regarding property investments, I tried to rent out 2 properties (both in SGP & HK) but I feel tired of dealing with tenants. Yet I am not wealthy enough to engage a property manager to look after all the nitty-gritties. However, I still like property-related investments. Just look at the list of multi-billionaires around this world, how many of them do not get involved in property? It might not be their core business but most of their income statements & balance sheets boost up directly or indirectly as a result of property ownership (e.g. McDonald in USA: one lecturer had even joked among some MBA students & asked whether McDonald should be considered as a property or fast-food company? Such a question was asked 27 years ago, I really don’t know what situation it is now). REITs provide a steady dividend income, yet not as volatile as developers’ stocks. Most of these are also trading at a discount in HK (as mentioned before). The discount is justified, frankly speaking, as the REITs properties are usually non-core ones which do not qualify to stay in the original owners’ core portfolio. You know very well, though we try to retain a bit of dignity by not calling REITs a dumping ground ! In times of systematic market crisis, REITs are RELATIVELY stable comparing with developers’ stocks as most of the lease income is not immediately affected. Having said this, I still prefer buying at 70% of NAV to keep a safety margin as Warren Buffet said. hi pf, thanks for explaining. indeed looking at margin of safety is good, and you are the kind of wealth builder that have build up much experience along the way and not looking at things from the superficial level. for myself, i take discount to NAV as a reference, but not the only one as the net asset value can be rather misleading as well, in the case of hong kong. every asset have their days of overvalued and undervalued. its often we don’t value them well enough.